Ask fellow campers about "Wasagaming Campground (Parks Canada)" and nearby attractions. Rate does not include the park entry fee. This is a large campground. It is divided into sections with unserviced, electric only, electric & water, and full hookups. We were in the full hookups section which was mainly pull-throughs with a few back-ins in the last row. Each site is surrounded by thick forest which gave lots of privacy. The park roads were paved while the sites were either gravel or paved. Ours was paved and not level side to side. The electric and water were located in the middle with the sewer towards the rear. All utilities worked fine. A table and a fire grill were included. Bear proof garbage bins were on each street in the campground. There was a washroom and shower house not far from our site that even had a baby changing table in the Men's. No OTA TV channels or Wi-Fi. I saw one tall big rig get satellite, but it would be impossible at most sites due to the trees. 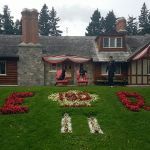 There is a trail from the campground that will take one down to the village centre where there are restaurants, bakery, and the visitor info centre. I would have no hesitation staying here again. 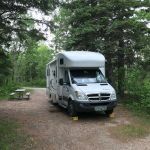 We camped at Wasagaming Campground (Parks Canada) in a Motorhome. The village of Wasagaming has a small gas station, but with limited maneuverability. There are boat rentals and tours at the marina. Check at the visitor info centre for daily events. 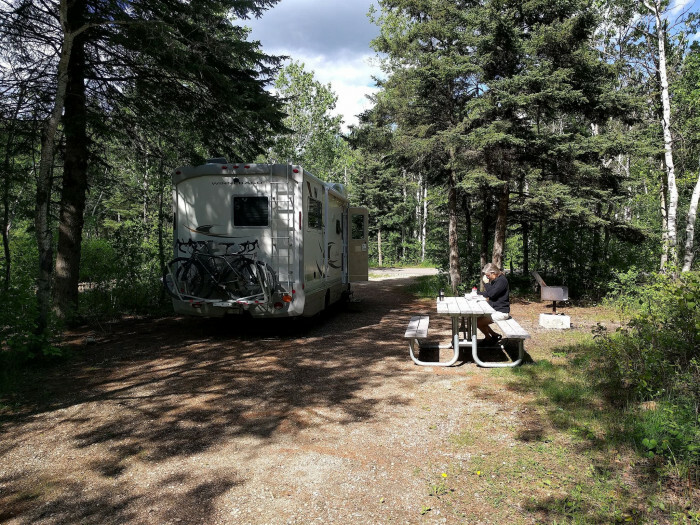 We were looking for a campground within Riding Mountain NP that would be central to park hiking and activities. We're self-contained and don't use the facilities except for an occasional shower. We camped mid-week in early June in our 8 meter (25 foot) motor home. This is a very nice, large (>500 sites) campground. There are 7 separate areas based on available services. We stayed in the 100 section (#107) with 15/30 amp electric only. All of the sites in this area are pull through. They are relatively long and narrow situated on a diagonal with greenery/trees providing privacy between sites. Most are level or require minimal leveling. The push button showers were clean and had ample warm (not hot) water. There was good ATT and Verizon cell coverage while roaming on Rogers service. We camped at Wasagaming Campground (Parks Canada) in a Motorhome. Visitor Center and Anishinabe Visitor Center were open limited hours. What can I say to add to the previous post. WOW, would come back for sure, but not to this site. Site 79 is in the last row (read dead end) turn 90 degree's LEFT and there it is 10 feet in on another 90 degree's .... impossible to get in with our 34 foot - 5th. Sooooo. Turn left. Back up so rear end is 180 degrees from original. then carefully pull into tiny spot (side to side) There are better spots (and worse, wow, its like parking on a hill in some places) - so use Google Earth Street View to poke around, it's shows all sites ... too late for us. Can't really add to the previous post (great) but at site 79 we were 2 min walk to town. Apparently bears are a problem here, so all food and BBQ's must be locked away OR the park rangers will confiscate them. 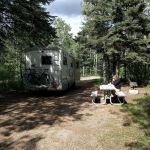 We camped at Wasagaming Campground (Parks Canada) in a Fifth Wheel. 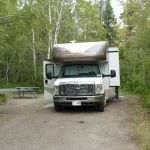 September 1,2,3, Wasagaming Campground, Riding National Park, Manitoba - $33 electric, no hookups to full hookups, over 700 sites located in six huge loops, dump station, water available, nice bathhouses and showers, site 120 This campground is located in Wasagaming townsite in the National Park. It is huge and in walking or biking distance to the town which is located on beautiful Clear Lake. We were in one of the just electricity areas and loved it. I thought this was the best section, sites 120-172, the sites were long and surrounded by Aspens. Our site was 120 at the end of the first road and no other camper was across from us or beside us on two sides. There was a camper to our right but the foliage gives you some privacy. The full serviced section looked good but some of the other sections were crowded and noisy. You can walk to town from the entrance area and there was a road and path near our site that went to the pathway and beach along the shore. Riding Mountain National Park is where the prairie meets the Manitoba Escarpment. The east entrance is on a gravel road and has some switchbacks, route 10 cuts through the park and is paved and most other roads are gravel. There are a number of lakes, backcountry campsites, hiking & biking trails and wildlife in this park. The townsite has shops, restaurants, beach, boardwalk, walking trails, boating and park Visitor Center. There is a drive north of town where you can drive into a gated area and see the herd of Bison that the park protects. Great place to stay a night or two and now they have put up some Otentiks for rent for winter camping that are completely insulated. Warning: the dump station does not have water for your units and also when you pull up to the entrance booth and get in line, get out of your RV and get to the window line. They check in by standing line not RV line. We didn't know this and so many behind us ran up to the window before we figured it out. We camped at Wasagaming Campground (Parks Canada) in a Motorhome. This a great campground and great little town. Lots to do for kids, beach, trails, kids activities and more. I would rate it a hidden gem. The only reason for 4 not 5 stars was some sites are not at all level but very workable. Lots of space between sites, good services, easy res the cation and check in. Given I s popularity make a reservation. Town is pretty, well kept and lak is crystal clear. We would come again! We camped at Wasagaming Campground (Parks Canada) in a Motorhome. Walk to the town it is close and lots to see! Well managed, clean great services, beach, hiking trails. Nice if you want to be close to civilization yet in nature. Expansion of services sites underway this year. Clear Lake is beautiful. It's alllll good there.... We camped at Wasagaming Campground (Parks Canada) in a Motorhome. Great full service campground with large clean sites in a beautiful surrounding. Lots to do around the park. We camped at Wasagaming Campground (Parks Canada) in a Travel Trailer. Very nice national park. The sites are on dirt, which made for a mess when it rained. The full service functioned with no problems. We camped at Wasagaming Campground (Parks Canada) in a Travel Trailer. Our full hook-up, pull-thru site was much better than our national park RV sites at Banff Tunnel Mountain, Lake Louise, and Jasper Whistler's campgrounds. Some tree/shrub screening between sites; nearby clean, heated restrooms; great WiFi, and walking distance to town. The town has a beautiful lake setting with extremely clear water, a long boat dock/marina, a swim beach, and rental and tour boats. Although we were there on a beautiful, warm fall weekend, the town was nearly empty of visitors. And, away from town, wildlife abounds, including a bull moose that crossed Route 10 right in front of us as we were leaving Moon Lake. Wonderful park, nice town, great campground! We camped at Wasagaming Campground (Parks Canada) in a Fifth Wheel. Meh...We decided to spend a weekend there for a free concert. It has the advantage of being within an easy walk of the Wasagaming townsite. The washrooms are clean and showers are free, not coin and newly renovated. Staff was friendly and polite. Downside, we got a no service campsite with the highway visible through the trees and the traffic was ghastly on the highway all night long. Noise noise noise. Radios, generators, children, motorcycles, cars, drunks in spite of the alcohol ban. Wet firewood that wouldn't burn was $8 for 10 logs. Our site was not level, and it was short and narrow. Traffic on our loop was also terrible with vehicles and impatient drivers going by so often it was difficult to back into the site. People were honking and going around us as we tried to back in and when we pulled out. If you want to be at the Wasagaming resort, it's perfect. If you want peace and quiet, and wilderness camp elsewhere in the park. We camped at Wasagaming Campground (Parks Canada) in a Travel Trailer. Wasagaming is a resort town in a rural area and everything is 3X higher than any grocery store in town. Stock up in the city before you arrive or expect to pay a lot extra. Location, location, location! Walking distance to town and Clear Lake. Nightly rate does not include $19 CDN to enter park. Sites are pull-through with bushes between sites. It had been raining and the sites was swampy with mosquitoes. Sites close to level. Bathhouse dated but only 1 shower. Clean to usual state park standards. What makes this place great is abundant wildlife. Saw 4 moose and a bear while driving through the park. Would stay here again. We camped at Wasagaming Campground (Parks Canada) in a Tent Trailer. A little difficult to find. Google maps shows the old entrance, which is now closed. Most uneven site we have ever parked in, although some of the neighboring ones looked much flatter. No WiFi. Pretty location very close to town, and a pleasant walk to the lake. Cost seemed high for what you receive. 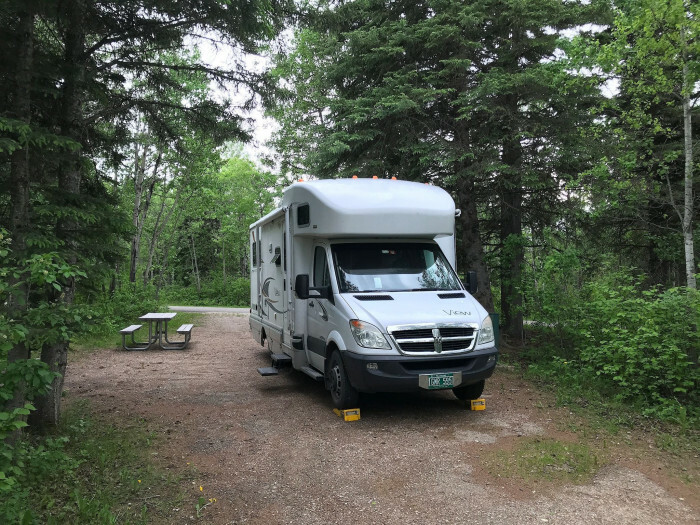 We camped at Wasagaming Campground (Parks Canada) in a Fifth Wheel. Large campground with everything from tent to pull through sites. On the edge of the town of Wasagaming, built in the 1930's. Many historic log buildings including one of the only remaining log movie theatres. Lots of hiking trails and wildlife drives. You WILL see moose, bear and deer in the park. Many other unserviced campgrounds in the park. On the edge of Clear Lake, a lake that is fed from springs. Cool clear water. Cons: absolutely none. Our most very favorite campground in North America. We camped at Wasagaming Campground (Parks Canada) in a Fifth Wheel. This National Park has so many sites that there's bound to be something for everyone. I was told that reservations are a must for the best 50% of the sites and they fill up fast. About 25% are not so good, either being really unlevel or not enough vegetation buffer between the sites. I saw quite a few 32 to 38 foot motor homes in the sites so most rigs will fit. Agree with previous poster about signage. I missed the sign and travelled 15 miles up hwy 10 before I could unhook and turn around. The problem is the sign to the campground is so busy with other things that a newbie to this park can easily miss the turn. Nice little town to stroll around, stop in the visitor center and or have an ice cream. The biggest improvement I think is needed, is another dump station. The lines were quite long on Sunday morning with people checking out. Also, I think quiet hours should be after 10pm, not 11 pm. It was quite noisy from 9-11pm on Friday and Saturday nights and nobody doing anything about it. Even so, this is another of Canada's nice national parks. We camped at Wasagaming Campground (Parks Canada) in a Motorhome. Unfortunately only spent one night here, but would highly recommend this park. It's well laid out, within walking distance to the town and lake, has spacious sites and is very clean. We camped at Wasagaming Campground (Parks Canada) in a Motorhome. Route 10 north/south through the park was a nice drive. Route 19 west from Wasagaming was a pretty drive to Lake Audy and the bison range. Route 19 east to the escarpment was closed during our visit. 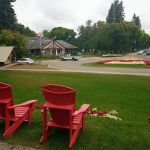 The town of Wasagaming is a 10 minute walk from the CG and includes shops, restaurants and a laundry. We did not see a grocery store. 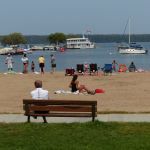 There's a beautiful park on Clear Lake with a swimming beach, boat rentals and multi-use trails. The park Visitor Center and Anishinabe Visitor Center were open limited hours. Are you affiliated with Wasagaming Campground (Parks Canada) ?